Granulation is the main manufacturing process for the manufacturing of tablets. It is of two types wet and dry that is adopted on the basis of the API used in the manufacturing. Granulation is a process of producing granules generally. 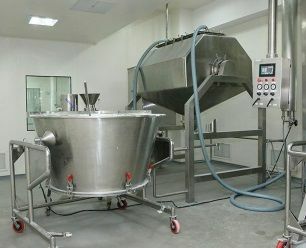 In pharmaceutical manufacturing, granulation process implies the techniques that are, used to combine powdered particles to form relatively bigger ones called granules. This process is used for commercial production of tablets. The granulation process allows particles to stick together more firmly. It increases the particle size of the constituents used, which are mostly very fine powders. The greater the particle size of a constituent, greater will be its compressive or binding ability. Sifting: Active Pharmaceutical Ingredient (API) and excipients are sifted, usually through a 40 mass or 60 mass sieve. When API and excipients are sifted they mix together. Mixing: In order to mix them up more thoroughly, the dry mixing process is utilized. Once the mixing is complete, granulating fluid is added to rapid mixture granulator or RMG. Drying: The materials are then dried in a dryer, usually a fluid bed dryer or a tray dryer. When the constituents have dried, they are then milled using 16 mass or 20 mass sieves. Lubrication: The final step is lubrication in order to make the particles adhere firmly together. This is done with the addition of a lubricating agent. The use of lubricating agents is particular to the types of API and excipients used. The most commonly used lubricating agent is magnesium stearate. The material formed is thus ready for further compression and manufacturing. Dry granulation does not involve the use of a liquid lubricating agent. This is because constituents utilized might chemically react with the agent used, thus dry granulation equipment technique is used. Dispensing: The first step in dry granulation is dispensing of the API and excipients used, in specified amounts. Dry Mixing or Blending: Once both the constituents are dispensed, API and intragranular excipients are mixed together through dry mixing. Compaction: After dry mixing of the materials, they are passed through roller powder compactors for compaction. This results in the formation of slugs. Slugs are the rough form of tablets, usually quite large in size. Milling or Crushing: The slugs are then milled or crushed until the required granule size is obtained. Depending upon the product requirement, sieves are used to attain granules of the right size. At this stage, further mixing is done with the addition of extragranular excipients. Extragranular excipients do not form the part of the main mixture; instead, they are added after the granulation has taken place. Extragranular excipients include diluents, disintegrating agents, and others. The materials are then ready as a result of the granulation process in pharmaceutical manufacturing for further compression. I want to read all your past blogs about pharmaceutical industry.please provide me link. I am big follower of your blog and sir i want to carry out product hold time study in our plant and there are more than 300+ product in our plant,so is it necessary to study all the product or by API wise. So is there any other way or not pls give me the details data. Hold time study for 300+ products individually is really a big task. You can do it in groups by API used/ preservatives added (if any)or not/ water used in manufacturing or not and so on. Alternatively you can create a matrix including all factors and select the products accordingly. Please note that hold time study 8s done for inprocess samples but not for final product. I want to know about the coating of tablets having Friability more than 1%. 1. Physical and chemical characteristics of the API and Recipients to be used. 2. What should be the final specification of the product e.g- Assay,CU,DT,DISSO etc as it mentioned in followed pharmacopoeia. 3. Type of release of the drug(SR,CR etc). 4. Moisture sensitivity of the product. 5. Depend upon issues found during compression stage of F&D study and result coming after the problem short out. 6. Depending upon what are the process facility can provide a company and by this F& D will short out the issues and will provide the any other process way to achieve the product final specification. So there are also so many criteria which may be briefly described by a rich experienced F&D person..
** Final product specification------->Compression Parameters(F&D Stage)------>Result in Granulation type and its parameters(F&D Stage).